Budget, resource and time constraints combined with increased competitive pressure and a weak economy have created a need for many small to medium sized businesses to re-access their traditional sourcing approach. Offshore outsourcing, no longer a strategy exclusive to large companies, can provide access to additional resources and technologies while reducing costs and improving time to market. While outsourcing offers many potential benefits, it also has its share of traps and pitfalls that are all to easy to fall into. With so many vendors, geographic choices and possible engagement models, where do you begin or more importantly, how do you begin your outsourcing initiative? Your practical guide to the realities of offshore outsourcing. I am currently the CTO of a prominent U.S.A. based technology company with with an iconic brand in Health Care industry. My first offshoring experience dates back to 1992 when I built my own team based out of Russia. Since then I worked primarily on the “buyer” side employing IT resources from all over the world. Having worked with offshore resources from India, China, Russia and many other countries, I gain a lot of experience and knowledge, I might not have seen it all, but have definitely seen a lot. The series, The Pragmatic Outsourcer, consists of 5 volumes designed to help you navigate through the sometimes confusing aspects of offshore outsourcing. 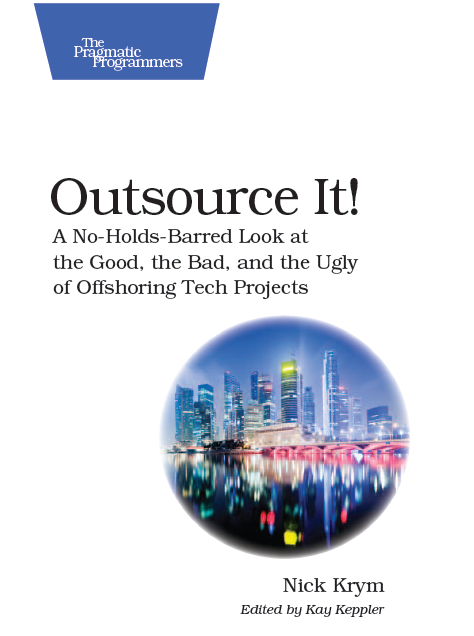 I hope that my practical approach to the pros and cons of outsourcing can help you save time, money and headaches by giving you and inside look at the realities of outsourcing that are not often discussed by vendors and consultants. What’s in this series and how can it help you? Making the Decision is designed to assist you with the initial process of considering sourcing alternatives, the pros and cons of outsourcing, as well as the myths and realities of cost savings, productivity and quality. Click on the image to download you free copy. Vendor Selection will help you sort through the sometimes overwhelming process of identifying potential vendors, requesting and reviewing proposals and geographic considerations for your outsourcing initiative. One of the most critical phases in your outsourcing process will be to negotiate an effective contract. Volume 3: Contract Negotiation will provide tips to help you create a win-win contract, identify potential show stoppers and establish incentive based service level agreements. Differences in culture, time-zones and language can create challenges that can jeopardize your outsourcing initiative. Nick’s Engagement Management volume provides examples and ideas on how you can improve communications, maintain control and build a productive team across multiple geographies. Outsourcing 2.0 explores new developments and approaches to offshore outsourcing including disposable outsourcing, utilizing freelances and using Agile development methodologies for offshore initiatives.